The Renault Kwid still makes heads turn, hasn't given me many reasons to crib, and is quite fuel efficient. What more could I ask for from a long term car? In the last couple of months I have been in and out of Mumbai and haven't got much quality time with my Renault Kwid long term car. Blame the Auto Expo, ZigWheels Awards and all the preparation that events like these bring along. However, I’ve managed to clock 1,000km on the car, which is mostly restricted to commutes from home to office and back, and that occasional run to the airport. So, here are some of the things that I noticed driving this very practical and attractive looking hatchback. In terms of looks, the smart Renault Duster-like silhouette gives the Kwid a strong, almost SUV-like character. 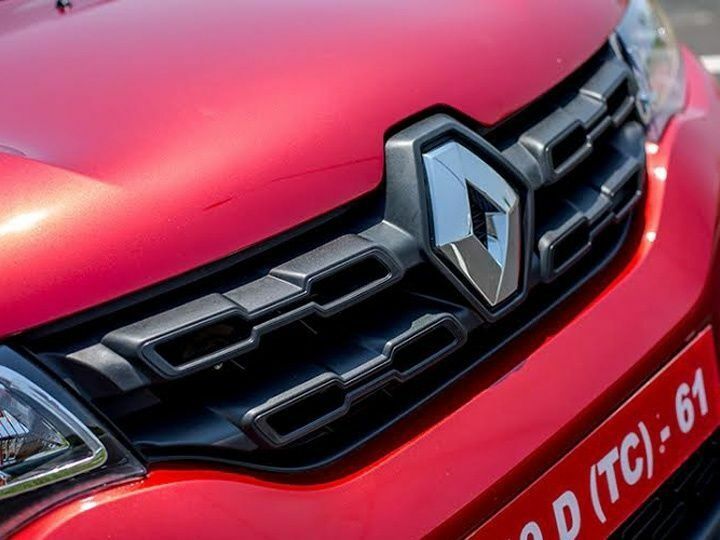 Small design elements like a oversized Renault logo done in chrome up front, turn indicators on wheel arch cladding, creases on the bonnet, to name a few, make the Renault Kwid stand out. However, am stilling confused how the unique looking badging on the rear door ended up on the roof of the car. In terms of improvements I would have liked better quality outer rear view mirrors and a more compact radio antenna, as both of these look rather prehistoric in a car designed in the 21st century. I would have loved a rear wiper and maybe larger wheels too, which could nicely fill up the wheel arches. But am just being greedy. Interestingly, the wheels come with just three lug nuts, instead of the usual four in average cars. The silver lining is that I’ll be saving time while replacing a flat tyre, something that thankfully hasn't happened yet. 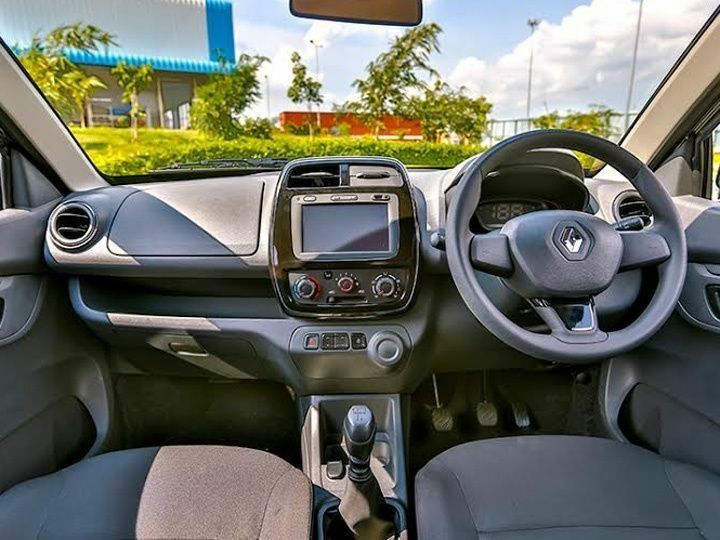 For a compact hacthback, the Renault Kwid has enough room in the cabin to ensure that four adults and a kid feel comfortable and not like sardines packed in a can. 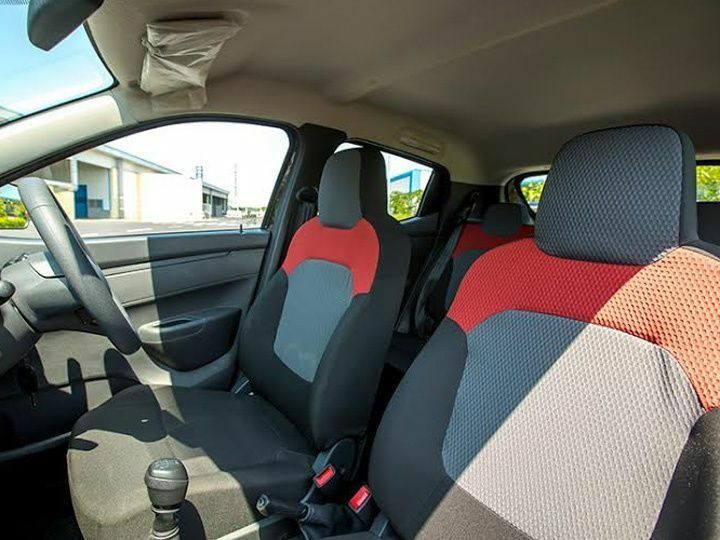 The dashboard fit and finish is better than the competition, with the large touchscreen as the centre pride, good quality air-conditioning knobs and vents, and a chunky steering wheel to finish off in style. The touchscreen interface is simple to use and can be paired easily with most smartphones, which makes making and receiving calls on the go a breeze. I prefer to keep music on pen drives and the USB port on the dashboard comes handy for it. Oddly in my car only the front right speaker is functional, so the sound quality is just about average. Thin padding on the seats and flimsy door pads also hint at cost cutting measures. Another oddity is the positioning of the central lock power window buttons on the centre console. But it’s something you can come to terms with quickly. 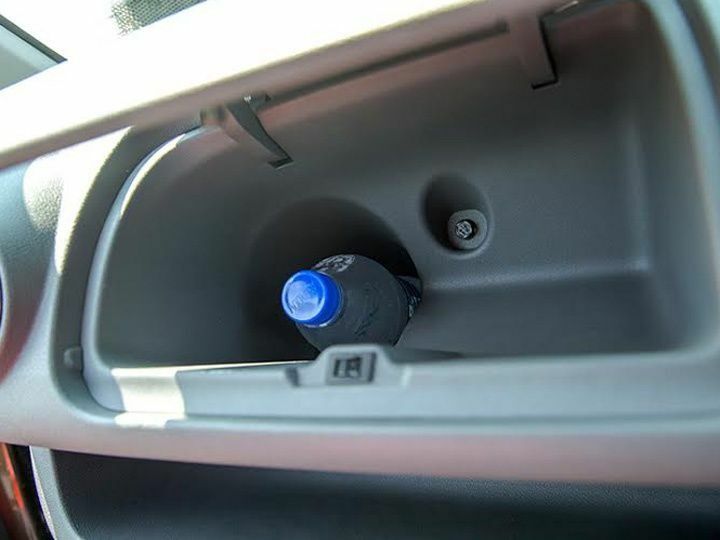 In place of the passenger air-bag you get additional storage space which come with pop-open lid. Renault should have offered additional airbags and ABS at least as an option. Coming back to storage, there’s no death of storage space in the Renault Kwid. In fact, the boot is more spacious than many larger hatchbacks, and I never have to worry when I have to receives guests from the railway station of airport. And even with a full house, the Renault Kwid’s 180mm ground clearance keeps the What I love though, is the driver’s information with a massive speedometer and ample of features like Distance To Empty, Average Fuel Economy, Trip Meter, Average Speed, and Real Time Fuel Economy. For an 54PS, 800cc motor, the Renault Kwid feels pretty responsive. The light 660kg kerb wight helps it sprint to 60kmph rather briskly, but it does run out of breath closer to 80-90kmph. Since my house is on an inclined road, the engine does feels strained especially if the air-conditioning is running. Sometimes I’ve noticed, during low and constant crawling, the engine feels jerky as if gasping for more fuel. Overall, what the engine offers is apt for commuting within the city. 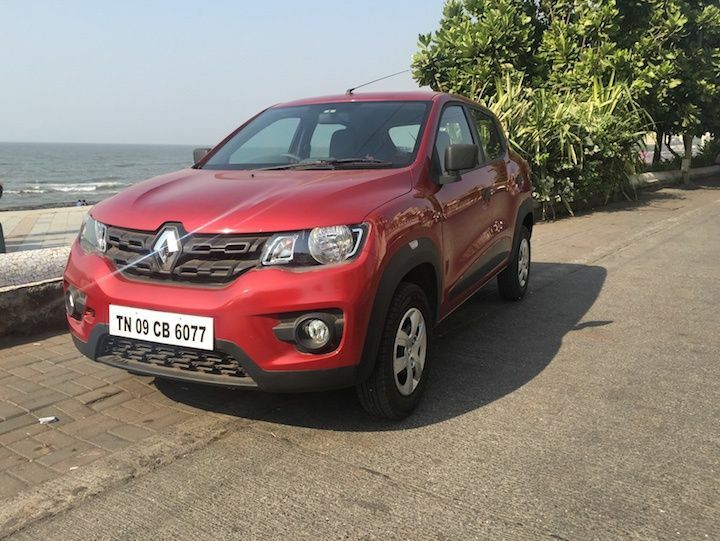 The ride quality makes up for most of the other minor issues on the Renault Kwid. From bad roads to speed breakers and rumblers, the Kwid has not once lost its composure. In fast corner it holds on to the line and never do the tyres screech in complain. You’re only left wanting for some more steering feel and better brakes. But that’s an enthusiast's point of view, as the light steering, clutch and smooth gearbox and well spaced ratios make it ideal for city use. On the highway, once slotted in fifth gear, the on board computer flash an unbelievable figure of 21.5kmpl, and in the maddening Mumbai traffic it still returns close to 13kmpl. If you have experienced Mumbai during rush hours, you’ll know that this is no mean feat. There are just a few things one expects from a simple city car. Keeping the budget constraint in mind the Renault Kwid has so far managed to tick pretty much all the right boxes. Cheers: Space, Ride, Infotainment system, Features. Sneers: Engine performance, Brakes.belly from scraping on severest of speed-breakers.